Springboks (Antidorcas marsupialis) are antelope that reside out in the wild in Africa, specifically in South Africa, Botswana, Angola and Namibia. They are memorable for their impressive jumping skills. When they're shocked or in a frolicsome mood, their bodies sometimes get as high up as nine feet off the ground. Diet-wise, springboks are herbivorous. When it comes time to eat, springboks partake in a combination of browsing and grazing. They browse more often than they graze. Some of their preferred forms of sustenance are grasses and shrubs. Succulent grasses and shrubs both are particular favorites for them. Their eating habits often change according to the specific time of year. During the especially arid months, they consume flowers to make up for their lack of access to water. Springboks also regularly feed on roots, herbs and leaves. Although springboks readily lap up water when it's around, they can easily handle being without it for extended stretches of time. Their hydration needs are frequently managed through what they eat. Not only do the aforementioned flowers accommodate their water demands, so do various roots and tubers. This ability to go without actual water assists them greatly as they reside in environments that are prone to frequent dry spells and little rain. Springbok mothers welcome their single babies in the wettest times of the year. Sustenance is usually abundant when conditions are wet. Springboks aren't predators and therefore don't feed on other animals. However, other creatures regularly dine on them. People have often hunted these ungulates for purposes of acquiring their flesh, for example. Apart from humans, big cats such as cheetahs and lions also occasionally prey on them. When springboks encounter predation threats, they often attempt to throw them off by showing off their big jumps. Dry and grassy plains are common locations of springboks within their native living environments. They often reside in areas that are free of trees. They also steer clear of high grasses. Agricultural sites are typical spots for them, too. Mature springboks typically weigh in the ballpark of roughly 59 to 106 pounds. They're also typically in the range of 27 to 34 inches in height. 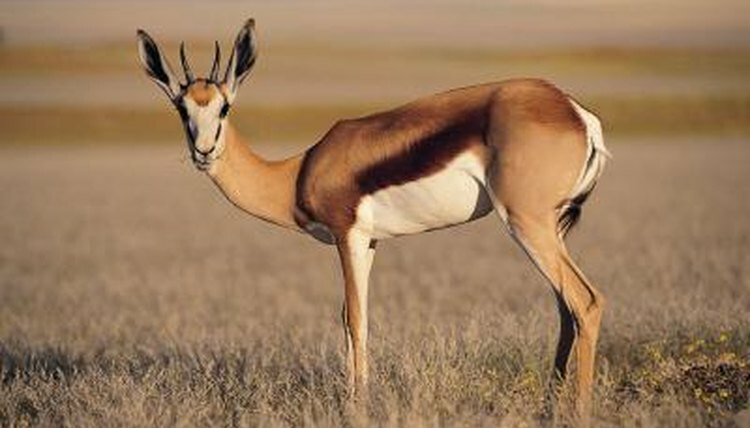 The top portions of springboks' bodies are reddish-brown, while the bottom portions are white. Their faces are white. Male and female specimens alike are equipped with dark horns. The males' horns are thicker and longer, however. As notably speedy animals, springboks can sometimes go as rapidly as 60 mph.